At the National Historic Landmark site where Silent Spring was written. Birds and their Ecosystem Services under a New Threat, Need our Help! I am president of the recently formed Rachel Carson Landmark Alliance (RCLA) and co-owner with my husband Cliff Hall of the Rachel Carson House, a National Historic Landmark where Silent Spring was written by Rachel Carson. For over a decade on a Saturday in late spring, Cliff and I in conjunction with the Rachel Carson Council and this year RCLA, have held an Open House at the Carson property featuring speakers on environmental topics, organic refreshments and a live musical component. This year we distributed information on cultivating milkweed plants for Monarch butterflies and other pollinators. The milkweed blossoms provide nectar and pollen that is safe for pollinators and the leaves are essential food for Monarchs and a few other larvae. Further, deer do not browse on the Milkweed plant leaves. The Rachel Carson Landmark Alliance (RCLA), our new organization has worked with a coalition of groups to promote planting of milkweed for the Monarch butterflies that migrate from Canada to Mexico through the US and to protect threatened pollinators in general. In June, Sec. of Agriculture Vilsack sent a letter to concerned environmentalists (including RCLA) about their efforts to increase populations of Monarch butterflies. In April 2014 First Lady Michelle Obama inaugurated the first-ever pollinator garden on the White House grounds. On June 24, 2014 The Washington Post carried a full page article on threats to bees, with the title of “We’re all getting stung.” The author advised that to help bees we humans should “Avoid using pesticides; eat foods grown without them.” This article was directly related to the President’s June strategy statement about bees. Behnke’s Nursery and Home Depot announced in June that they intended to stop selling plants treated with neonicotinoid insecticides to help protect pollinators. Winston concludes with a report on a study from his university which found that crop yields and profits are maximized if considerable acreages of cropland are left uncultivated to support wild pollinators. The difference between planting the whole field and leaving 1/3 wild could be $27,000 profit per farm in the first case and $65,000 in the second. The crop they studied was canola. Based on past experience we have hoped that if communities were given previously unavailable information about chemical pesticides’ hazards to health and the environment that they would consider looking into alternative landscaping practices with the intention of eventually adopting the less toxic methods for use on community-owned properties. However, pesticide companies’ powerful influence opposes attempts to replace chemical pesticides with alternatives. Recently, a woman at a national chain store in the Washington, DC area was told by the clerk when she asked for an alternative herbicide Are you crazy? We only sell what the big corporations push and that does not include any non-toxic materials. RCLA advocates for citizens to have a choice of weed- killing products. This sadly does not exist at some national chain stores. Moving away from our present-day major reliance on chemical pesticides for landscaping, in Montgomery County would support the actions by Sec. 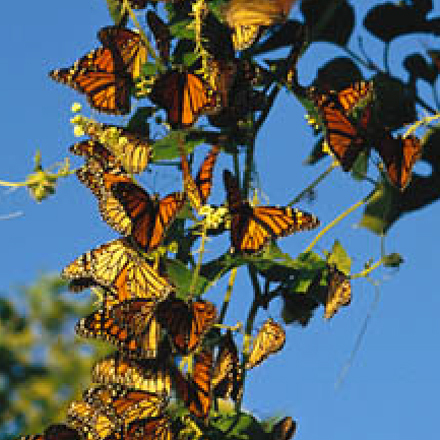 Vilsack and President Obama to help Monarch butterflies and pollinators. Banning the use of toxic chemical insecticides known to be hazardous to butterflies and other pollinators for use on plants that attract pollinators should be implemented immediately in conjunction with urgent efforts to increase these threatened populations. Major problem pesticides for pollinators are from the group of neonicotinoid insecticides widely used in horticulture. These are also the chemicals that Behnke and Home Depot have announced that they plan to avoid in future. Further, the planting of chemical-free pollen and nectar sources (including asters, milkweed, goldenrod, purple cone flower, etc) throughout the county could result in residents enjoying the sense of wonder that comes from visiting butterflies and the satisfaction of knowing that the community is making a contribution to the restoration of these important and threatened wildlife populations.